Less than 1 mile to the Beautiful Santa Fe Plaza! Welcome to Casa Preciosa! This Gorgeously restored historic home is ready to welcome! Be the first to stay in this meticulously designed and finished home! Please admire the originality throughout while still enjoying todays convenience items. This home has several features! Convenient location in downtown and only 1.1 miles to the plaza square! You can walk there in 20 or drive there in 6. 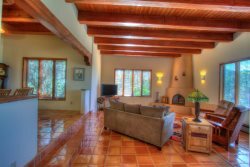 Whatever you choose you are sure to enjoy the Santa Fe authentic scene along the way! Located in the Historic District, this home had to pass a stringent historic approval. This is to ensure it maintains its authenticity! You will, no doubt, enjoy your stay in this neighborhood! You have access to the whole house! You can use everything within, and including the patio furniture that we keep inside. You are welcome to take it out and set it up, but please bring it in when not in use! I manage several charming properties in this amazing city. I give my guests space and provide them with self-check-in instructions to make it more convenient for my guests. However, I will make myself available if needed! - Please, no smoking in the home. Please dispose of trash in bins next to the driveway. Please enjoy patio furniture, but be sure to bring it into the home when not in use.